Wednesday, December 31, 2014 at Westminster Presbyterian Church, 1301 Kimball Avenue in Waterloo. Tuesday at Kearns Funeral Service Kimball Chapel, 3146 Kimball Avenue in Waterloo and an hour prior to the services on Wednesday at the church. Moses Seh Boakai, age 39, of Waterloo, Iowa, died Friday, December 26, 2014 at University of Iowa Hospitals and Clinics in Iowa City. He was born January 1, 1975, in Tahn, Liberia, the son of Gbaja Seh and Bandu Seh Boakai. Moses attended the University of Liberia. He was united in marriage with Tata Scott in October 1996 in Liberia. 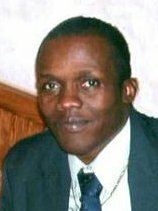 Moses and his family came to the United States in 2007. He formerly worked for Tyson Foods until ill health caused his retirement in May 2011. He was a member of Westminster Presbyterian Church. Survivors include his wife, Tata of Waterloo; two daughters, Tenneh Boakai and Ellie Boakai and a son, Edward Boakai, all at home; a sister, Jenneh Sesay and her husband Lamin Fahnbulleh of Chicago, Illinois and a brother, Mohammed Boakai of Jacksonville, Florida; numerous nieces and nephews and special friends, Esther Sherman, Freeman Ochai, Betty Kamara, William Boakai, George Okoro and Kola Cooper. Moses was preceded in death by his parents.